Mrs. Cerna by Sertan Saltan. © Sertan Saltan. LONDON.- After a record number of entries, four artists have been short-listed for the BP Portrait Award at the National Portrait Gallery, one of the worlds most prestigious art prizes. This year the prize received 2, 372 entries, an increase of 196 on last year. For the fifth year, the competition has been open to all aged 18 or over. 55 portraits have been selected for the exhibition at the National Portrait Gallery, which runs from 16 June until 18 September 2011. The four artists shortlisted for the 2011 award are: Ian Cumberland for Just to Feel Normal; Wim Heldens for Distracted, Sertan Saltan for Mrs. Cerna and Louis Smith for Holly. In addition to a prize of £25,000, the winner of the BP Portrait Award will receive a commission worth £4,000. The second prize will be £8,000 and third £6,000. For the fifth year there will be a BP Young Artist Award of £5,000 for the work of an entrant aged between 18 and 30. Both Ian Cumberland and Sertan Saltan are eligible for this award. The award and the winners of the prizes will be announced on the evening of Tuesday 14 June. Ian Cumberland lives and works in County Down, Northern Ireland. Since graduating in Fine and Applied Arts at the University of Ulster in 2006 he has had a solo exhibition at the Albermarle Gallery in London and has won several awards. Ians work is represented in public collections in Ireland. He was a BP Portrait Award exhibitor in 2009. His shortlisted portrait is an enigmatic half-smiling head-and-shoulders study of a friend, who has a tuft of short blond hair and slightly-closed left eye lids perhaps indicating a more melancholy demeanour. This is a painting of a friend whose story is like many others from my generation that have fallen victim to themselves and their preferred habits, says Cumberland. The title Just to feel Normal refers to his answer when asked why he continues along his chosen path. Wim Heldens is a self-taught, professional artist who lives in Amsterdam and whose work has been seen in numerous group and solo exhibitions in Europe and the United States. He was a BP Portrait Award exhibitor in 2008 and 2010. His sitter is Jeroen, a 25-year-old philosophy student to whom the artist has been a father-figure since he was four. He has sat for him over 20 times, and is pictured here leaning on a section of wall with a pencil in his hand wearing the black and grey of which Heldens says, he only seems to be wearing these days. The simple white studio walls are used as basics for his composition, focusing on his sitter in the light from the window. I have been fascinated with painting Jeroen in all stages of life through growing up. While I have painted him many times in groups, once in a while there is the desire to paint a simple portrait of just him. Now, he is an intelligent and sensitive young man. Born in 1982 in Eskisehir, Turkey, Sertan Saltan now lives and works in Avon, Connecticut (USA), where he is developing a studio. He studied painting at a famous atelier in Istanbul before moving to the United States in 2006 to continue his studies at New York State University where he gained a BFA in Product Design. 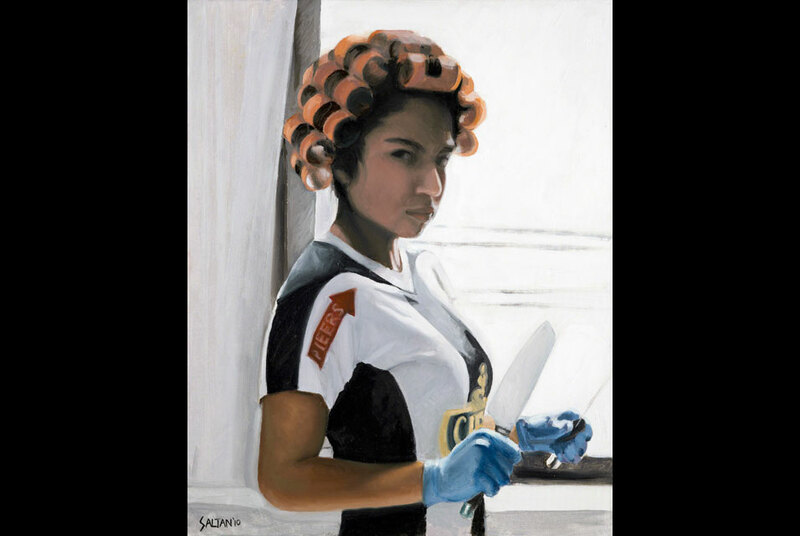 His sitter Mrs Cerna is the younger sister of a friend in New York City, who is caught glancing at the artist, almost menacingly, in her hair rollers and latex gloves sharpening a large knife. The contrast of knife, gloves and rollers brought both humour and horror to mind, he says. The animated sharpening of the knives and thoughtful facial expressions were burned into my minds eye. I wanted to capture on canvas that moment which allows the viewer to meet this extraordinary woman and experience the richness and complexity of her preparation for Thanksgiving dinner. Louis Smith, from Manchester, studied painting at Sheffield Hallam University and scene painting at the Royal Academy of Dramatic Art. He has exhibited in Britain and Italy and at the 2009 BP Portrait Award. His eight-foot portrait shows a naked model called Holly hand-cuffed to a rock in a wild cave-like landscape. The Allegory of Prometheus is re-imagined in female form. Prometheus stole fire from Zeus and give it to mortals; as punishment he was bound to a rock while an eagle ate his liver daily only for it to grow back to be eaten the next day. Holly looks into the eagles face with calm resilience, accepting her fate. Its a message of composure in the face of adversity, something we can all draw strength from in our struggle to make a daily living. The portrait has a huge gilt frame with a marble plaque at the base, inscribed with the name Holly. Its an extravagant attempt to illuminate the Baroque style, says Louis, who was helped with set, frame and background painting by Carmel Said. Des Violaris, Director, UK Arts and Culture, BP, says: We are delighted to continue to support this fantastic award, which has again attracted the highest quality of entries. We look forward to announcing the winner.